The Most Awaited Tamil Movie of Hero Dhanush Thodari Going to Hit Sliver Screens world wide on this Thursday. The Film Features Dhanush, Keerthy Suresh, Karunakaran, Ganesh Venkatraman and Thambi Ramaiah . Film is Directed By Prabhu Solomon and Produced By G. Thyagarajan, G. Saravanan and Prabhu Solomon. Music is Composed By D Imman. Dhanush plays the male lead role of a Railway pantry worker while the female lead Keerthy Suresh has acted as a film makeup artist travelling in the train.D.Imman has done the musical score and the songs were released last month. Vetrivel Mahendran has handled the cinematography while L.V.K.Doss has taken care of Editing. The movie is releasing in nearly 60 screens in USA. The film Thodari has some talented actors playing the leads and important roles. Dhanush is seen playing the role of Poochiyappan. The female lead Keerthy Suresh is seen playing the role of Saroja. Karunakaran, Thambi Ramaiah and Ganesh Venkatraman, Ganesh Uthaman were seen playing the other roles in the film. 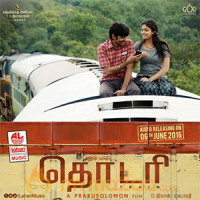 Thodari is a simultaneous release of Dhanush’s Telugu film Rail. The makers are happy with the release happening for the film both in Telugu and Tamil. Poochiappan (Dhanush) and Saroja (Keerthy Suresh) whose love story begins in a train. Dhanush is said to play the role of a employee who works in the catering department of the Indian Railways. A suspense thrill-filled movie is released today and all the possible emotions and feelings have been put into the story of this movie.However, it looks like the problems faced by the couple in this movie are quite complex. The opening scene of the Movie shows us that a news channel labels Keerthy Suresh as a terrorist. The Film also suggests that the train is hijacked, and the terrorists plan on kidnapping the minister who is travelling in the same train. Dhanush is seen performing some high-voltage stunts.The film also stars Ganesh Venkatraman, Thambi Ramaiah, Radha Ravi and Harish Uthaman in pivotal roles.